In the seventh pAsuram, parAnguSa nAyaki says “I will ensure that he comes to me to shut the mouths of those who find faults in him, and I will bow my head to him for his favour of coming to me”. Am kolO – can we? Oh friend who is having vast waist area which is decorated by beautiful garments! In front of those women who blame us, can we see and bow our head to emperumAn who invited my good heart cutting off its other ties, capturing me by his attractive qualities and activities, who is resting in seclusion in the wavy ocean, who is my lord who manifested such reclining posture and made me his servitor, who is a great benefactor having divine disc? valaiyuL agappaduththu … – Capturing me in an inescapable manner with his smile, glance etc. nal nenjam … – parAnguSa nAyaki is of the nature that she will make her heart which is more eager than her to reach emperumAn, to work with her as said in periya thiruvanthAdhi 1 “nenjE iyaRRuvAy emmOdu nI kUdi” (Oh heart! work with me here). alai kadal paLLi ammAnai – emperumAn again entered the unreachable [milky ocean] thinking “If I remain in SrImath dhvArakA, every one will come there claiming their right saying ‘this assembly is specifically to help women'”. alai kadal – The turbulent ocean which cannot be measured by women. alai kadal paLLi ammAnai – As he attained great treasure [her heart], he went on an oceanic trip. Azhip pirAn thannai – The divine combination of his hand and the chakra (disc) is so beautiful that we cannot withdraw from him thinking “alright, he reached an unreachable place now”. He is such that we will be tempted to even cross the ocean to attain him. kalai … – Oh friend who is having vast waist area which is decorated with beautiful clothes! Should your words not reflect your beautiful form? Alternatively, it can be considered that parAnguSa nAyaki is resting on her friend’s lap and speaking this. Previously she said “thOzhimIr ennai ini umakkAsai illai” (Oh friends! I don’t have to obey you anymore”; here, she is saying “thOzhi nam kaNgaLAl kaNdu” (Oh friend! both of us see …) – how do these two statements match? Since the friends spoke like the mother, she said “ennai ini umakkAsai illai“; but now she is speaking to her best friend who is like-minded instead of those other friends. nam kaNgaLAl kaNdu – Though she (friend) is giving good advise now, while seeing they both see together through four eyes. Or she need not see using just her both eyes [i.e., normal vision and peripheral vision]. thalaiyil … – The people of the town were blaming “when in separation, she did not remain waiting for him matching her femininity, and he too delayed his arrival”; in front of such people, should he come and should I bow my head with gratitude for such favour? When kUraththAzhwAn was explaining this pAsuram in a scholarly assembly in the evening in a village named “rAjEndhra chOzhan“, a very elderly SrIvaishNava named Amaruvi nirai mEyththAn nambiyAr who was more than hundred years old, stood up with shivers and asked “AzhwAn, can a thalaimagaL (uththama nAyaki – most perfect woman [like the empress]) bow her head down?” and AzhwAn replied “Yes it is acceptable. We have SishtAchAram (practice of elders); sIthA, the divine daughter of SrI janakarAja, did that saying in SrI rAmAyaNam sundhara kANdam 38.56 ‘SirasAchAbhivAdhaya‘ (bowing down in salutation)”. For ordained practices, there is none better than the descendants of janaka as said in SrI bhagavath gIthA 3.20 “karmaNaiva hi samsidhdhim AsthithA janakAdhaya:” (Have janaka et al not attained the result of self-realization through karma yOga only?). [SrI rAmAyaNam sundhara kANdam 38.56 is explained in detail. sIthA speaks this SlOkam to hanuman during their meeting in aSoka vanam] kausalyE … – In this world, women usually pray and beget a son thinking “He will protect us here in this world and will also ensure that we don’t enter hellish regions [it is said that, sons, by performing their pithru kAryams (rituals for ancestors) properly, save their parents from reaching hell]”; but our mother in law, kausalyA, due to her broad-minded nature, prayed for a son who will protect the world; should her thoughts fail? Am I not part of that same world? Now, she advised to me “generally women support their husbands when they are good/smart and disregard them during other times; you have to support him at all times/situations”. While I was following her instructions, as crops will get destroyed under the originating place of a great flood, he forgot to protect me. Please tell SrI rAma that I asked “if this is because of his heart caring less for me?”. “tham mamArthE sukham pruchcha” – We don’t have to pray and achieve his protection for him, since even that is based on his heart’s desire, and we are only praying like this due to being unable to wait for the due course of his action. As long as he is present, we will be protected; that being the case, you tell him “we can only pray for his true existence and there is no shortcoming in him”. “SirasAcha abhivAdhaya” – sIthA mercifully told hanuman “As he has not given us special consideration of marrying us unlike being treated like ordinary citizens, we should at least get what he gives to ordinary citizens. And if we only get what they get, we too should do what they do towards him [simply being respectful towards him]; this being the case, you fall at his divine feet on behalf of us saying that we bowed with our head at his divine feet”. 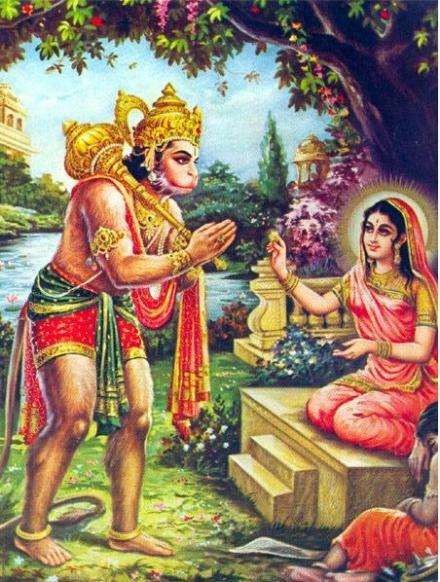 When asked “Are these words spoken out of praNaya rOsham (love fight) or spoken out of desire?”, AzhwAn mercifully explained “Previously, when she saw thiruvadi (hanuman) arriving, she spoke angrily, but he spoke pleasingly to change her anger, and becoming merciful, she spoke out of non-attainment of her desire due to not having prApthi (aptness of time)”. This entry was posted in thiruvAimozhi, thiruvAimozhi 5th centum on June 20, 2017 by Sarathy Thothathri.